By this point you can clearly see that this isn’t sports related at all. But this movie and its sequel was the real deal for me growing up. Tim Burton’s 1989 Batman film was my introduction to the world of superheros, which I cannot get enough of to this very day. 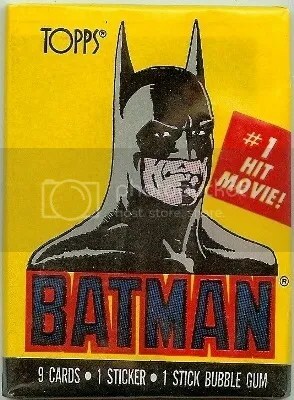 Prior to 1986, Batman was stuck in that BANG!, POW!, and BAM! campy Adam West style. Frank Miller’s 1986 graphic novel The Dark Knight Returns gave Batman a much more serious and darker tone, resulting in what we’re all use to seeing today. Burton drew upon that world as an inspiration for Batman and Batman Returns. 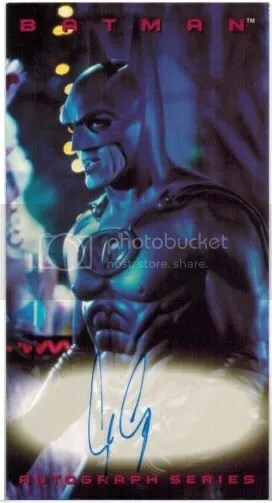 Unfortunately live-action Batman films fell off the correct track with Batman Forever and Batman & Robin and didn’t return until Christopher Nolan’s Dark Knight Trilogy. Many critics believed it wasn’t possible to create a successful comic book movie, but this film really showed them. It was a box office hit bringing in more than $400 million. This movie is one of the main reasons why we have so many comic books films today. 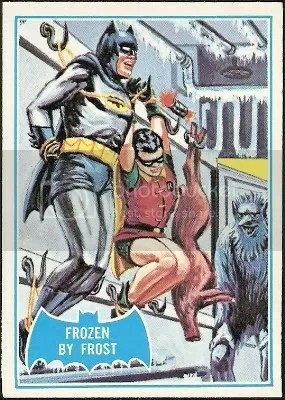 Topps was able to cash in on some of that success by issuing a Batman card set. The set was released in two different series each containing 132 cards and 22 stickers. Series 1 has white-bordered fronts while Series 2 has yellow borders. Many of the cards feature movie stills with captions, but others focus on storyboards and design art. Topps issued these in both box and factory set form. Due to the overproduction of cards at this time, this set carries little value now. Both Series 1 and Series 2 sets can be found for under $20.00. The only way any of these cards will increase in price is if Topps were to issue buyback autographs of Michael Keaton and/or Jack Nicholson. Just like they did with Sylvester Stallone and his Rocky and Rambo cards in Topps 75th Anniversary. 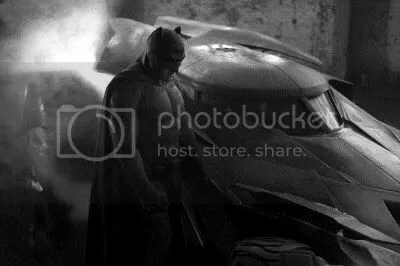 For those fans that haven’t seen it yet, here is our first look at Ben Affleck as Batman in the Man Of Steel sequel. Looks badass and very Frank Miller-like. 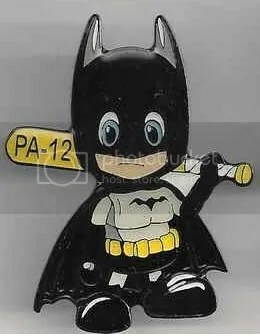 How can you go wrong with a baby Batman pin made for the Little League World Series? Correct answer. You can’t! This pin is part of a 6-pin set made for PA District 12. The other five pins feature Superman, Robin, Joker, Catwoman, and Lex Luther. All of them are designed to look as if they are little kids. Individual pins can sell for $5.00 t0 $10.00 a piece. We’re only about 3 weeks away from the 2013 Little League World Series. Many new pins are on the way. Maybe this year I’ll get an ESPN pin, but they aren’t the easiest to find unless you’re willing to spend some big bucks. Visitors will surely enjoy the newly renovated World of Little League Museum. Over the last week superhero fans received a ton of news on upcoming films during the San-Diego Comic-Con. Probably one of the biggest announcements was that the Man of Steel sequel will feature Batman. Very little is known about the film right now other than the logo they unveiled. Speculation about the film’s title is already floating around. Most fans believe it will be called Batman vs. Superman. Both Batman and Superman are good guys, but Batman doesn’t always get along with everyone. They both have different ways of getting the job done. Unlike the Batman we saw in Christopher Nolan’s Dark Knight Trilogy, I believe this new Batman will be one that can handle the sci-fi world we saw in Man of Steel. In addition to that, I think this Batman will already be established and fully operational. We don’t need to see another origin story. Either way I’m looking forward to it. Batman and Superman have had their disagreements before, and now its time to see it on the big screen. With a Flash film in the works, we all know that this is leading up to a Justice League movie.